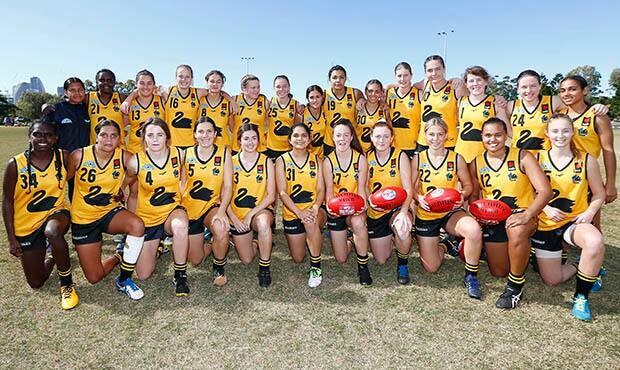 Eight of Western Australia’s brightest football talents are in line for All Australian honours following the conclusion of the NAB AFL Women’s Under-18 Championships. Sabreena Duffy, McKenie Dorwick, Courtney Hodder, Sonia Dorizzi, Tayla McAuliffe, Emily McGuire, Kate Bartlett and Rosie Deegan were named in the 54-player All Australian squad. Vic Country, who went through the championships undefeated, dominated the squad with 15 entries, while Queensland had 10 representatives and Vic Metro nine. NSW/ACT has five players in the squad, while the Allies (a combined squad representing South Australian, Tasmania and Northern Territory) have seven. The squad of 54 will be split in two and play a curtain-raiser to the NAB AFL Women's State of Origin match, to be played during the AFL ‘Celebration of Football’ between the end of Round 23 and the first week of the AFL finals. Forwards: Danielle Ponter (Allies/NT), Jordyn Jolliffe (NSW/ACT), Sophie Conway (Queensland), Kalinda Howarth (Queensland), Jemma Abott (Queensland), Emily McGuire (WA), Kate Bartlett (WA), Rosie Deegan (WA), Denby Taylor (VC), Eden Zanker (VC), Emerson Woods (VM).